So, I just couldn’t resist. I had to carve our calf into the pumpkin. Now it sits in the center of the office and I can’t wait what everyone will say Monday morning. 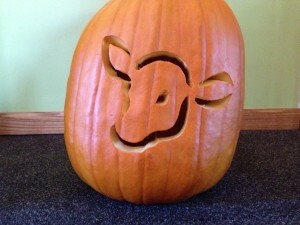 If you’d like to make your own Calf Pumpkin, here is the template.Pumpkin Calf Template (PDF) Just print it out. Tape it to the pumpkin. If you need to, fold the edges to curve around the pumpkin and then mark up along the dashed lines. Take the paper off and carve away!